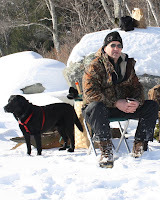 The Maine Outdoorsman: I'm A Fire Starter! "There's something not quite right with you boys!?!?!" and thus was the beginning of an interesting conversation I had with my Dad on the ice Saturday afternoon. Inquiring with the slightest bit of hesitation and an equal measure of what the #$%& am I getting myself into I asked "why do you say that?". He took a deep breath and then started . . . "Well, you boys layer up in all this new fangled super insulating clothing, and then sit out in the middle of the lake all day, despite the blasted weather conditions, in lounge chairs drinking beer and something you boys affectionately call "white lightening". Then when it comes time to eat you wolf down sandwiches warmed under your armpits and a couple little debbie snack cakes and call it a meal?!?! Lastly if you do somehow magically manage to catch a fish you take it home and put it in the freezer . . . where it may not get eaten for 3-4 months!" Well, at that point I stared blankly at the old man trying to figure out exactly what was wrong with the series of events he had just relayed . . . I got nothing . . .
Clearly exasperated, the old man took another breath and continued . . . "I taught you boys better than that! Don't you remember all those times fishing pickerel ponds as little kids? Don't you remember warming frozen toes and fingers on a warm lake side fire? Don't you remember eating freshly caught fish wrapped in tin foil and gently steamed on the fire? Don't you remember cooking hot chocolate in an old tea pot? AND lastly PLEASE tell me you remember eating red hotdogs and marshmallows cooked on freshly cut alder branches?" I again stared blankly . . .
Disgusted the old man staggered across the deep snow to the opposite bank and started hacking down dead branches with a small hatchet. As I drilled holes and prepared lines he worked tirelessly to organize a sheltered "hangout" area. As I finished baiting the last hook the smell of acrid wood smoke drifted across the hard water bringing with it a lifetime of happy ice fishing memories that began slowly seeping back to my conscious mind. As I walked over to the old man my brother and I both asked in unison "Hey Dad did you bring any of those red hotdogs?" "Certainly" said Dad . . . I thought you boys would never ask! I wanted to share this story as it really is interesting how ice fishing had and has changed tremendously from my Dad's generation to mine. He and his friends were without snowmobiles and would hike up to 5-10 miles to access good ice fishing waters. They enjoyed only tea (who can walk 10 miles drunk!) and ate everything that they caught fresh from the icy waters. When I compare that to our "modern" fishing lifestyle I begin to feel a little bit disgusted with myself and what I have allowed to be stolen from the enjoyment of this great outdoor activity. Well, with my eyes now open I vow to make more of a concerted effort to look at the "old" ways and make sure these excellent traditions and treasured memories are carried forward to my children! It pleases me to no end to read a wonderful story about generational mindsets. My kids frequently ask me, "Why are you doing it that way dad? It would be so much easier if..." To which i frequently answer, "Because, if it was good enough for Abuelo (Grandpa), it's good enough for Dad!" As I look around at all my friends and their extensive collections of "toys" . . . ATVs, Snowmobiles, Power Ice Augers, Motor Boats, etc. it is easy for me to see why most of the US population is overweight and dying of heart disease. It is a testament to doing things "the hard way" that we as a people have lost touch with . . .
Last Christmas the number one selling gift item was the Nintendo Wii . . . imagine if instead it had been a fishing pole or a BB gun?!?!?! You know Rabid, I've got to throw out another angle. Until I was 22 years old I had never been ice fishing, my father-in-law took it upon himself to show me how he best practiced the sport. After spending a couple of years lugging way too much stuff, I realized that minimizing the process makes for a better experience. Now I do exactly what you do, I never knew about how people used to do it. Throw in new regulations, limits, landowner confrontations, and other impeding processes, one would have to say that times are changing. I'm a traditionalist who employs new technologies, tries new things, and develops my own niches to best practice what we do. You ask your dad how well those hot dogs would have tasted the weekend before at Beech Hill Pond as we were in the middle of a very populated lake. If it had not been for my portable ice shack, we may have been eating raw wieners. It's hard to see how things are changing, but how we as outdoors enthusiasts maintain our presence. I'll look at the old ways, but for a man whose time is limited, I'll take the perks as well. I got thinking about my traditionalist comment with references to using technology. I often wish that I could experience the times of yesteryear, but realize that we today are the link from the past to the future. By using new technologies, we are honing our craft so that the future may build on our experiences. I suppose that means on some occasions, I need to practice with the new but not completely dismiss the old. Your Dad does have a great point. I do agree with DEDH a little. People's lives are so much more hectic now that taking advantage of some of today's technologies make it possible for people to enjoy these experiences at all. That's a great story. There is something to be said for tradition. And food cooked over an open fire just tastes better. Or at least that's how I remember it from my days as a Girl Scout. "high tech express" making to much of the outdoor world. Let's get back to the basics and simply have fun and enjoy our time on the water or in the field. I am adding your link to my BlogBuddies blogroll over on my blog. Would you consider adding my link to your blogroll? I wanted to thank you each for your positive comments and reaction to my story. It is encouraging to see that many of us still believe that there is something to be said for getting back to the basics. My Dad read the post for the first time this morning and I received an e-mail about an hour ago that (quite typical of the old man) simply stated . . . "Nice write up...guess you were listening. Luv ya PA"
Thanks again everyone for all the positive comments! Don’t get me wrong, I lovingly embrace my laptop computer, cell phone, GPS device, and yes even my PS2 but I also recently disconnected my TV, I do not have Internet at home, I set my cell phone to always be on vibrate (to not disturb others), I always carry a map and compass (and know how to use them!) and try to read absolutely as much as I can. I don’t think is it so much about the technology but rather how we use/abuse the available technology and how that ultimately impacts our world and the people around us. Like anything it is about moderation and balance. No problem, I added you to my blogroll . . . you have a great site! Look forward to your future comments.